If you want to generate all of the App files in your solution, you can use the Application Pad to get the job done. Two ways to do this. Click on he drop arrow next to the generate button on the App pad. If “Generate Selected” is marked then you can select all of the Apps in the Application Pad using Control-Left Click or Shift-Left Click. Once your Apps are selected press the Generate button to start. 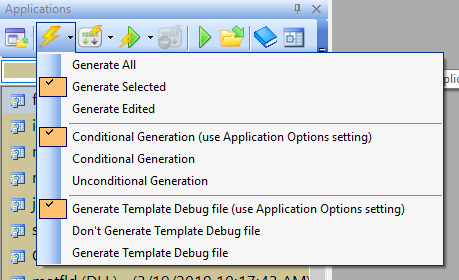 If “Generate ALL” is marked, then you can just press the Generate button and it will process all Apps in the solution.